There are a few reasons why I haven’t yet read the novels in Peter V. Brett’s DEMON CYCLE. First is that Bill’s been reviewing them, so there’s no urgent need for me to do so for this site. (I know that sounds ridiculous, but that’s kind of what happens sometimes with a group blog.) Second is that they’re a huge time commitment — the last two were each 700 pages long! Third is that the series isn’t finished yet and I have so many unfinished series floating around in my head that I want to wrap up more of them before starting something new. However, I’ve been collecting the novels in audio format at Audible and I’ve been reading the spin-off novellas that Subterranean Press sends me. I really can’t wait to indulge myself in Brett’s world when the time is right. I know I’m going to love it because Bill does, and because I love the novellas. 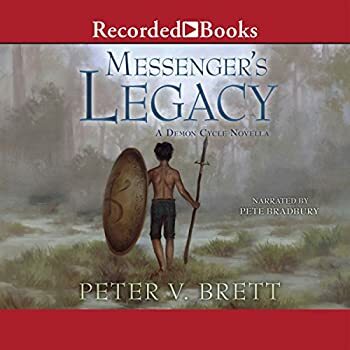 The most recent novella is Messenger’s Legacy, which I read in both print and audio formats. You don’t need to have read any of Brett’s previous work to enjoy this. The story is about a six year old boy named Briar who is bullied by the people in his village because of his dark skin. When a tragic event occurs and suddenly Briar feels like he has nobody to care for him, he runs off to live in a nearby bog. Those who are familiar with Brett’s world know that this is much more dangerous than it sounds because after the sun goes down, various types of demons come out to prey upon any humans who are stupid enough to venture outside without special wards. How long can Briar survive? Unbeknownst to Briar, there are a couple of humans who care about him. One of them is Ragen, a Messenger who has recently retired. When he hears about Briar’s plight, he decides to risk his life to search the bog for the boy. Anyone who’s already a fan of THE DEMON CYCLE is sure to enjoy Messenger’s Legacy. Brett has created a fascinating demon-infested world that’s slowly dying. It’s a scary place to live and it’s natural to sympathize with most of the characters. Briar, particularly, is easy to love because he’s been unfairly ostracized for years, he endures a major life-changing tragedy which he thinks is his own fault, and he seems destined to live out the rest of his life (what little there may be) in danger and fear. Ragen is dealing with his own dramatic life changes. I enjoyed spending time with these characters and look forward to seeing more of them when I read the novels. I was happy to hear that Briar has a major role to play in The Skull Throne. 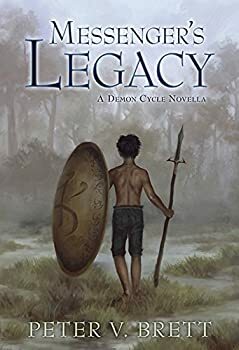 In Messenger’s Legacy Brett uses Briar’s mixed parentage to deal with such topics as racism, religious intolerance, and bullying. While on one hand I appreciate the messages that Brett is trying to convey, I also couldn’t help but notice that the author had Something To Say About Our World, which served to remind me that I was reading a fantasy instead of living one. This isn’t really a criticism, just a note about my personal taste at the moment I was reading Messenger’s Legacy. I happened to be on a two-day vacation at that time, which is probably why I was looking for more of an escape. Perhaps another time I would have welcomed a Message. The audio version of Messenger’s Legacy was produced by Recorded Books. This 3 hour long audiobook is read by Pete Bradbury, the narrator who reads the other books in THE DEMON CYCLE. He does a great job.